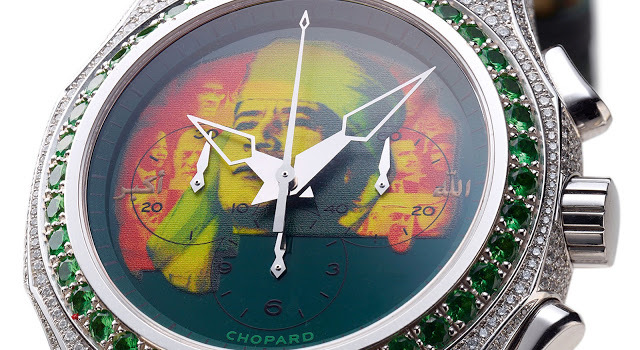 A large and unattractive jewelled Chopard watch made for Muammar Gaddafi will soon go under the hammer at Antiquorum’s upcoming Hong Kong auction. Antiquorum auctioneers continues to build its rogue’s gallery of timepieces: having sold a Patek Philippe Nautilus once owned by a yakuza boss earlier in 2015, the auction house will soon sell a possibly unique (thank goodness) Chopard chronograph made for Muammar Gaddafi. Created for the occasion of the 40th anniversary of the Libyan revolution, and a watch Chopard surely regrets, it’s in white gold and unappealingly set with diamonds and emeralds. 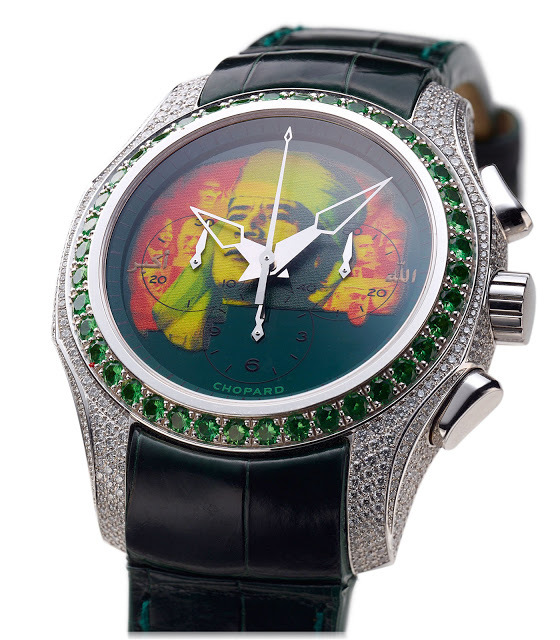 In the ostentatiously gauche style of the late Libyan leader, the dial is dark green with a silkscreened image of Gaddafi along with independence leaders of other nations. This gaudy chronograph is just one of a several hundred watches Chopard created for the Libyan revolution anniversary celebrations in 2009. A controversial move at the time, Chopard’s creations for the anniversary event included a series of L.U.C XP watches featuring a stylised map of Africa on the dial (one of which Sotheby’s sold in 2013). And several news reports at the time also note that guests at the celebrations were each given a Chopard wristwatch with an African map on the dial, with Libya marked by a single diamond. Chopard, however, is not the only watchmaker to have made wristwatches for unsavoury leaders, though it’s probably the most recent. Timepieces made by Patek Philippe featuring the emblem of Saddam’s Iraq continue to pop up regularly at watch auctions. But such happenings are increasingly rare, especially for established brands, given their awareness of the resulting bad press. The Gaddafi chronograph is estimated at US$32,000 to US$62,000, and will be available at Antiquorum’s October 25 auction in Hong Kong.